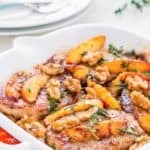 These Grilled Pork Chops with Peaches and Walnuts are the easiest and most amazing pork chops ever…ready in 20 minutes! It doesn't get better than that. Just peachy! Season the chops with salt and pepper to taste. Reserve. In a skillet over medium heat melt butter. Add peach slices and cook until lightly browned on both sides, about 2 minutes. Remove from pan and place on a plate. In the same skillet cook the chops on both sides until golden brown, about 5 minutes. Place peaches, walnuts, rosemary and thyme over the chops. Sprinkle with brown sugar. Cover and cook for 3-4 minutes. You can also make this recipe with chicken breasts, just make sure to adjust cooking times.